It’s official. I can’t make bread. To ensure my success, I rewatched all the videos, read all the recipes and made sure I tried to follow things to a ‘t’. 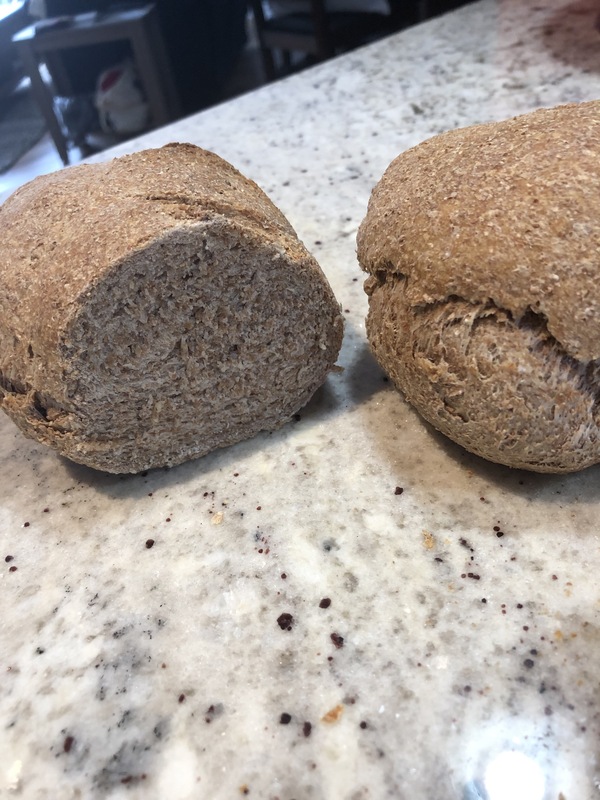 This time, I used the baking stone and whole wheat flour and, for all my efforts, I got another inedible bread brick, albeit of a slightly darker colour. Now, in order to gain some pity points, I should mention that it seems there isn’t one bread recipe out there but a million and they all contradict one another. One called for hot water while another claimed hot water killed the yeast and destroyed the bread. Some tell you to knead like there’s no tomorrow, some tell you not to touch the dough. Some say the trick is all in how your dough feels, others say you have to measure things scientifically. It’s pretty confusing. Did I get any pity points? Looking back at my first two attempts, I figured I didn’t let my dough sit long enough (only a couple of hours). This time, I let it sit overnight; that’s at least 12 hours of that dough sitting there with nothing else to do but puff up some bubbles. You’d think the resulting bread would be different in some way, right? Nope. The second bread is just as dense and difficult to eat as the first. Maybe it needs more yeast or a different type of yeast or maybe it needs less kneading or maybe it needs less time to sit…or …maybe it needs me to stand on my head and whirl around a bit. Or maybe, just maybe, we can go to the store and buy a loaf.